Alicia: We arrived 18th June with two other volunteers- Susan (Edinburgh) and Sofia (Canada). As Susan had luckily booked a taxi we were able to get a lift all the way to the reserve. When we arrived there were three other volunteers - Sebastian, Tanja and Bjorn all from Germany. The reserve was owned by Juan Pablo and his wife Alexandra, and they lived there in the main house with their two sons and three mad boxer dogs - Amber, Chica and Fido. 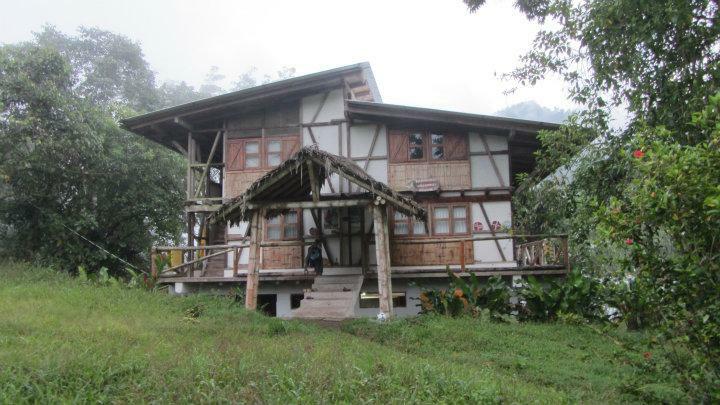 The reserve was in the cloud forest, set along the western slopes of the Andes between Aloag and Santo Domingo. On the reserve there was a school (run by Alexandra), stables and a cow shed where the cows were milked daily, loads of fields and 2 gardens - vegetable and medical. Our Volunteer House was separate, located just down the road, and a few other staff including Elsa the cook and her daughter Jenny, and Maria, Elsa's assistant. As a treat, me, Mike and Susan went to Otavalo for the weekend for Inti Raymi - Winter Solstice celebrated by the Incas, but also St John the Baptists feast day so a big deal in Otavalo. On our arrival on Friday, we met some Americans - a couple from south Carolina, and a guy from North Carolina. After Happy Hour cocktails and burgers, we hopped into a taxi and went to the Cascadas (waterfalls) to join the locals for a big party at midnight. When we arrived at the falls, the place was bussling with people, there was lights, stalls and numerous people playing instruments and dancing around. To get to the waterfalls themselves you have a take an eery walk through the forest, along the way we saw a couple of Inca ceremonies being preformed. When we arrived at the water fall it was local tradition that people would get under the falls and bathe in the water. So, after a few glasses of chicha (Inca beer) Mike decided he would join them in the freezing cold water for a dip. Needless to say, I was not pleased though Mike was a happy, cold bunny after he'd dried off (Mike: Always trying to stop my fun that one ;), I had a great time, but not very well thought through as after I'd got in I realised I didn't have a towl...no matter though, it was time to whack the clothes back on and continue with the party!). The party then continued with more chicha, cheap rum in plastic cups, and the guy from South Carolina running around with a Inti Raymi mask eating anticucho (beef heart skewers) and salchicha (sausage) asking the ladies to "smell my fingers, it's only salchicha!" The next day we managed to spend a nice day roaming through Otavalo Market - a must see in Ecuador, 'cos its huge. Brought some paintings and a new pair of sun glasses (as I'd left mine on the bus from Machu Picchu) all-in-all a nice weekend until we headed back to Quito to watch the football and England lost :( Then, having had an awful bus journey back to La Hesperia, we were met by a pot of rice, a can of sardines and cockroach covered pancake things :S Was grim and moral between me, Mike and Susan hit a new low, but at least it was a welcome reminder we were back in the Selva (jungle). The next week went by uneventfully except for a few new arrivals - Andisheh from Canada, and Annie and Adam from Seattle, and the departure of Bjorn. More bottle filling, field clearing and mula taking (forgot to mention our friend The Mula - stubborn old Mule who we had to take down the hill with milk laden in his back). Three hour round trip at best, but he likes to stop and eat A LOT! Mike made history however by taking over four hours with the Mula, as the beast decided to have a sit down halfway down the hill, then as he was ridiculously late, the old man from the village had to come up and help him LOL. A special mention must be made about Sebastian, as when Bjorn was in the reserve he was extremely reserved and quiet, however after Bjorn left, he really was the life of the party! He liked to drink the local moonshine (Trago)...a lot... enjoyed to dance, particularly tap dance and would occasionally smoke Oragano. On the Friday we had a hike with the group to a waterfall in the reserve. Long walk across and at times through the river (thank goodness for wellies) to a lovely waterfall - Mike had a splash around in there and one guy managed to lose his shorts lol. We had a steep climb on hands and knees back to the reserve. That evening again we were left with slops to eat, so we managed to raid the cupboards and make a feast for ourselves including some boxed wine. For the weekend we decided to stay in La Hesperia, and ventured out to Santo Domingo for the day - it is, a hole shall we say. Nothing much to the city except a place to purchase boozy provisions for the week. As it was my birthday the following week, me and Mike went back to Quito to treat ourselves with a nice hotel which turned out to be great (Sky TV with back-to-back Friends. What more could you want? :D) we visited the Teleferico - a cable car to volcano Pichincha - and went for an off-trail climb, nearly making it to the top, followed by candy floss at the bottom :P In the evening we went back to my favourite place Mozaico where Mike treated me to Canelazo (hot naranjia juice with sugar cane rum and spices) and lush Greek food. It topped off a lovely weekend. Next week saw the arrival of Claudia, Wenke and Matty, and we said farewell to Annie and Adam not before my birthday celebrations though. Day before my birthday I had the best task to do - make Dulce de Leche! This is a Caramel made using only a 2:1 sugar to milk ratio. Took 4 hours but was lush on our breakfast. Also we added the stirring action to the Dulce de Leche song :D - a random Ecuadorian song that the chorus sounded like they were singing "Dulche De Leche", although it wasn't acutally the words and to this day we don't know what the song was actually called. For my birthday I had a morning of hard macheteing, followed by reading and singing to the kids at the school. Then in the afternoon ... filling bottles with sand! In the evening though we had a party with all the volunteers and staff, with sangria, sidral (an alcoholic apple drink we falsely thought would be cider) chocolate cake and, the best bit, a PIÑATA! Mike and the guys made it using a type of palm to make a cage filled with sweets, and hung it up in the relaxing area. Was awesome. Then we were treated to a 'Striptease' from Sebas to Tom Jones, and salsa dancing. Was a brilliant night - Mike stayed up late to try the special trago. Trago was the moonshine aguardiente we brought from the village, and a special way to prepare trago was to fill a bucket with it, chop some fruits and bury it in the yuca patch (optional) for up to a year. Now I hear it tasted pretty special, and the guys looked pretty worse for wear the next day. Also apparently the salsa dancing went on a bit longer, with Pablo dancing 'sucio' (dirty) with Annie, though he denied this "hay espacio" as he said there was space between their hips so it was ok lol. Annie and Adam left on the Thursday, with Sofia and Susan leaving Saturday. Sebas stayed til Sunday with his last night consisting of muchos trago and a memorable game of charades with a twist. Was hilarious and we all had a great night. (Mike: The jungle was an amazing experience, it did take a little getting used to, especially at night in the relaxing area - the rest area - where insects of all shapes and sizes, including my favourites, the flying cockroaches, gathered round the lights, fruit and split trago. But once you got used to it, it was actually amazing, you could go into the bathrooms and see bugs that you couldn't even imagine existed or a tarantula, or scorpian etc. The birds where brilliant, we saw such a variety of tanajers (colourful birds), parrots and green toucans each day. There was also a huge number of butterflys, so many infact that we were still seeing new ones on our very last day, there was an elusive butterfly that was around the size of a blackbird and bright, chrome-like blue. I tried for the entire time I was there to get a picture of it, but no joy. After getting over the initial disappointment of finding out that the work sounded mainly like farm work (which for my money...you could do anywhere in the world, why had we paid to come to the jungle to do it?) was actually ok, I planted nearly the amount of trees that had set out to plant before I came (around 150). This doesn't account for the number of trees I cut down with a machete though, although I am assured they were all "bad trees". Plus using a machete on a tree was both a great stress reliever and incredibly cool. The people really made it for me though, we made some great friends in a lot of the people there, Annie, Adam, Susan and Sebastian in particular. Man, did Sebastian like the drink and "make party", he mentioned once that it felt weird at work because he wasn't hungover, only the second or third time in his entire 18 weeks there. Susan managed to teach me a thing or two about using my camera, which came in really handy. Whilst me and Annie had a couple of great jam session with her singing and me on guitar.